In Alter Ego the player controls a hero who has the rarest of conditions: a phantom twin, his alter ego. 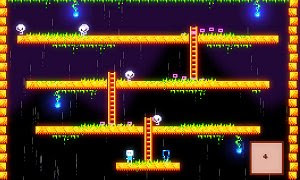 In glorious and colorful retro-style, this is a freeware PC game that tasks players with solving levels taking in consideration that when the hero moves, the alter ego also moves in a mirror way. Sometimes movement may be mirrored horizontally, other times vertically. Players may also directly control the alter ego in a level for a limited number of times.